Extraordinary and exclusive furnished 3-room apartment. Listed old building from 1908. Ceiling height up to 380 cm. Open sunny living room with suite, American kitchen (with fridge-freezer combination, dish washer, glass-ceramic cook-top, oven and extractor hood) with a stand-alone island unit. There is a round dining table for 5 people in the dining area. The bedroom has a double bed, an integrated reading area with an armchair, commode and bench. Bright dressing room with a shelving system, sofa, large mirror and lots of storage space. There is laid parquet flooring (oak tree) in bedroom, living and dining area. The designer-bathroom has a premium equipment and a glass shower. The round washbasin of porcelain is on a wooden console. Own washing machine and dryer machine is available. Parking on the street, free of charge with parking license. No spot guaranteed ! Shopping facilities (bakeries, supermarket, organic store) as well as public transport close by. Designer bathroom equipped with high quality furniture from Duravit and Lineabeta, spacious glass shower. Neighbouring walk-in wardrobe with sofa and large mirror. Additional: hair-dryer, towel radiator, movable mirror cabinet, amenities, washing machine and dryer. parking license without any extra charge for parking area on the street ! I-Pod, I-Pad and I-Phone system for I-Tunes ! 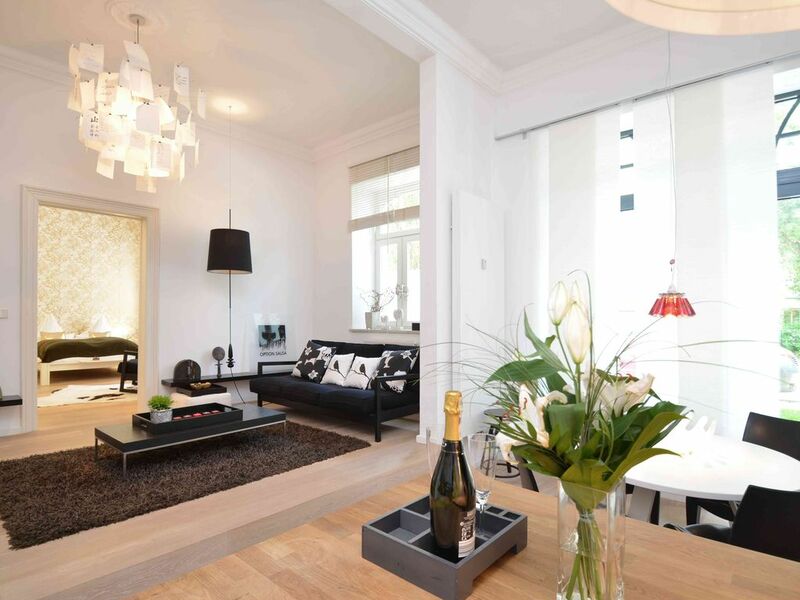 Exclusive furnished designer apartment in historical building of 1908. Newly renovated in autumn 2015. Designed and furnished by an interior designer. Modern style. Living in the centre of Munich. Max. 5 adults and 1 kid/infant. Baby cot and high chair are available on request ! 3-rooms: living room, bedroom, walk-in wardrobe, bathroom and kitchen ( American kitchen with split-level ). No air-con, but fan available ! Parking license for parking in front of the apartment free of charge. Free Nespresso, tea and sweets available. Nice location. Convenient to UBahn as such can be quite noisy until 11pm and beginning at 4am. Absolutely beautiful apartment in the heart of Munich. Owner met us when we arrived and warmly welcomed us to Munich. She made herself available via phone if we had any questions about the property, the city, the transit system, stores, restaurants etc. We were there for 2 weeks and kept commenting how blessed we were to be staying in this beautiful home. We cooked breakfast daily, and several evening meals as well. Grocery stores were 1-3 blocks away. Great late night eating restaurants within walking distance as well. Apartment was beautifully furnished. We especially enjoyed having a washer/dryer in the home. Thank you Tanja, for making our stay so memorable. We highly recommend others to stay here on their next visit to Munich. A tastefully designed apartment that gives you the option of being very active - all top tourist spots are minutes away by public transport (U-bahn entrance 10 feet from the front door of the building) - or just relaxing...ultra-quiet neighborhood. Pristine apartment, tastefully designed in crisp airy modern style, perfect for couple or family, with an absolutely wonderful owner/manager. Easy booking process. Friendly owner. Nicely renovated apartment. Great location. Steps from the U-Bahn. They offer a pass for street parking in front of the unit but it can be challenging to find a parking spot. Would definitely stay here again. I just returned from a 4 night stay in Tanja's amazing apartment in Munich. What a delight! The apartment is spacious, modern, spotlessly clean and fully equipped. There was nothing that I needed or wanted that wasn't provided. The very best thing about the apartment is the location. It is literally 10 steps from the doorway to the entrance of the Kolumbusplatz subway station. It's so easy to get anywhere in Munich. And Tanja is the perfect host, an absolute pleasure, and so business-like. I've already been recommending her place to my friends as the best place to stay in Munich. The flat is beautiful - just like the photos and very clean. Tanya was a great host- met us on arrival and had many helpful tips for the area. The metro stop is steps away from the front door - but many times we just walked into downtown Munich as it was only a 30 min walk. As mentioned previously in reviews, you have to go through the bathroom to get to the second bedroom, but that wasn't a big deal as we were all family staying there. This place was much better than other AirBnB rentals that I have stayed at. We really enjoyed our stay in Munich! Accomodations for discerning guests, for their business or leisure stay, in the center of Munich. Nestled in the midst of the popular area „südl. Au“, where tradition, modernity, luxury and design harmoniously connect together and provide an unobtrusive home feeling. Here one can enjoy the level of a first-class hotel suite, while temporarily experiencing what it is to be a resident in this hip district. 3 stations by metro to city centre. Metro station 'Kolumbusplatz' a doorstep away. Best address near the river 'Isar', high living standard and recreational value. All historical sites very close. Deutsches Museum - Munich Philharmonic - the Bavarian State Opera - the Bavarian National Theater - Gärtnerplatz-Theater - the legendary Viktualienmarkt - everything is reachable by walking. Fair only 15 min. away per tube ( U2 line, 10 stations, direct line). 45 min. drive to mountains and lakes of south Bavaria. Subway: less than 20 m.
230,- € / 2 persons / per night Add. persons: 55,- € / per night Kids under 16 years: 30,- € / per night Kids under 3 years are free of charge. Surcharge for fairs, bank holidays, Oktoberfest etc. : 100,- € / night cleaning fee for short-term stay: 140,- € ( 1-4 pers.) 160,- € ( 5-6 pers.) cancellation policy: Short term stay (1-60 days): cancellation up to 60 days before arrival: free of charge cancellation 59 to 30 days before arrival: 20 % processing fee cancellation 29 to 14 days before arrival: 50 % processing fee cancellation from 13 days before arrival: 100% of total accommodation rental price In any case processing fee for cancellation: 100,- € + home away money transfer fees Planning Your Journey Early Arrivals and Dropping Off Your Luggage: We know what it's like to arrive early in Munich after a long flight. If your apartment is ready, we will do our best to check you in as soon as you arrive. However, on busy arrival-and-departure days this is not always possible. So, some guests choose to book the night before in order to guarantee the apartment is ready right when they get into the city. If your apartment is not ready when you arrive, we are pleased to hold your luggage (from 10 am onwards) for you until your greeting appointment (starting from 1 pm). Late arrivals: Our Munich team is available seven days a week, from 9:00 am to 7:00 pm. If your arrival to the apartment is between 7:00 pm and 10:00 pm, please note that our office will be closed and we will need to schedule a special greeting time for you. Between those hours, a late arrival surcharge of 50 € will apply, payable directly to your greeter. Please email us at info@home-deluxe.net, if you plan to arrive after our office is closed so we can make arrangements for you. If you have any last-minute questions about your trip to Munich, please let me know. We look forward to welcoming you in Munich !